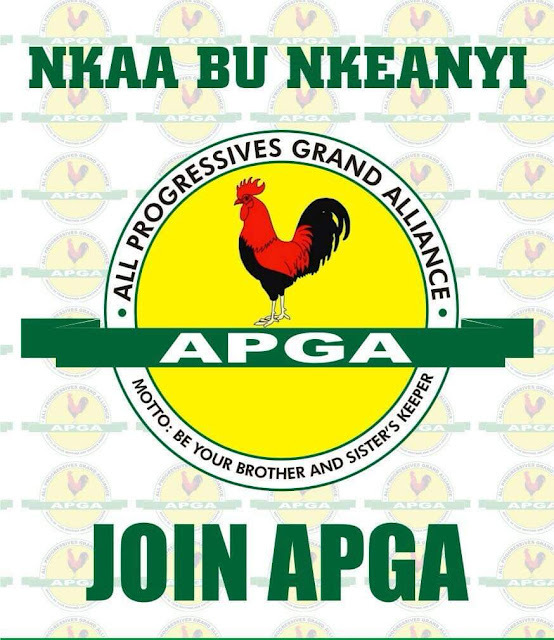 In addition to its philosophy and motto of "be your brothers and sisters keeper," another of the important mantras of the All Progressives Grand Alliance, APGA, the ruling party in Anambra state, is "nkea bu nke anyi," which translated into the English language means "this one belongs to us". This particular slogan was actually introduced under the superintendence of Governor Willie Obiano, as the Leader and Board of Trustees, BOT, Chairman of the party. The slogan has indeed sank and embedded in the consciousness of Ndi Anambra, nay Ndigbo largely because the four governments enthroned by APGA in Anambra state since 2006, have consistently given good governance and provided verifiable democracy dividends to the people. The first and second APGA governments in the state was headed by Mr. Peter Obi. Guided and inspired by the everlasting supreme leader of the party, late Dim Chukwuemeka Odumegwu-Ojukwu and the egalitarian spirit of the party as enshrined in its constitution and manifesto, Obi performed brilliantly. His performance was satisfactory to Ndi Anambra, who also respectfully accepted the passionate appeal of Dim Ojukwu to give a second term to Obi, on the platform of APGA. The party marched on, and in 2013, the Anambra electorate again, overwhelmingly elected another of its gubernatorial candidate, Chief Willie Maduaburochukwu Obiano, who was sworn-in as governor on March 17, 2014. Obiano performed superlatively in his first term hence his resounding victory in the staggered November 16, 2017 gubernatorial poll in Anambra state for his second term. His victory was unprecedented because for the first time in Nigeria's history, a governorship candidate won convincingly in all the local government areas of his state. Anambra has twenty one local government areas. Obiano's victory was so convincing and doubtless that none of his numerous contenders contemplated challenging the result in the Election Petition Tribunal or any Court of Record in the country. Since he came on board for the first time in 2014, the incumbent Anambra helmsman has ceaselessly demonstrated responsiveness to the plights, yearnings and aspirations of the citizenry. The good governance and ceaseless delivery of democracy dividends by his first and second administrations have not been in doubt. In fact, his governments have since 2014 brought so much innovations into governance and done so many things in uncanny manners or as the French would say "with panache". Obiano's security architecture is the best in the West and Central Africa sub-regions. With this enabler, his administration has created a clement environment for local and foreign investments. Investments attracted so far by his administrations are estimated at over four billion dollars. The peaceful atmosphere in the state has facilitated the implementation of the state government's socioeconomic blueprint known as "Four Pillars of Development" anchored on Mechanised Agriculture, Oil and Gas, Trade and Commerce, in addition to Industrialisation. Some novel achievements of the present APGA led Anambra state government include but not limited to; introduction of yearly forty million Naira worth Community Choose Your Projects and Execute Program for all the one hundred and seventy nine towns in the state, Economic Stimulus Package for less privileged persons, massive road and bridge construction across the three senatorial districts of the state, street lighting across major towns and the obvious transformation of Awka, the state capital to a befitting status among others. As a matter of fact, if one continues to enumerate the accomplishments of APGA led governments in the state in the past twelve years and ten months "Chi g'eji, Chi g'abo." It is therefore against this background that the Anambra electorate should not hesitate to, once again, vote massively for all candidates of the All Progressives Grand Alliance in the forthcoming general elections in the country. This is because the party has proved beyond all reasonable doubts that, unlike other political parties, it has the fundamental interests of Ndi Anambra, Ndigbo and Ndi Nigeria at heart. APGA has over the years particularly demonstrated that Anambra belongs to it. On the other hand, Ndi Anambra are totally convinced that the party is also their own. No wonder they proudly shout it on top of their voices, on the mountain zenith that; "nkea bu nke anyi". HON. EGBUNA AMUTA is the Senior Special Assistant (SSA) to the Governor on Grassroots Media Mobilisation.